Between work, school, kids, and everything in between, eating healthy can feel like a luxury that you just don't have time for. The beauty of it all is that it can be done. And you don't need much time to do it. Here are my 11 go-to tips for keeping it clean when time is of the essence. A registered dietitian shares her best tips -- and they're actually doable. Hi, I'm Jessica Jones, a Registered Dietitian. Finding the time to eat healthy is one of the biggest concerns my patients voice when it comes to making diet changes -- and I totally understand. You're busy. Busy as hell, in fact. 1. Don't keep junk food in the house. This is basic, but it took me years to realize. Personally, if I have a bag of chips or a pint of ice cream in the house, there ain't no tellin' what may happen to it. I may be able to practice portion control, or I may eat it all--on sight. For this reason, I simply can't have these things in my home on a daily basis. It's much easier to eat healthier if you only have healthy foods to choose from. 2. Make some easy, healthy snacks for the week. 3. Save time by buying things pre-chopped. 4. And definitely don't skip breakfast. Did you know that the origin of the word breakfast is break fast? This is because you haven't been eating throughout the night (fasting) and you need to break that fast upon awakening (breakfast). Please don't skip breakfast--ever. Your body needs to eat. Plus, eating early revs up your metabolism, which is a good thing. If you find that you don't have time to make a five-minute green smoothie, breakfast burrito, or this delicious avocado toast in the A.M., then have no or low-prep breakfast options on hand. Need some ideas? Try: Fruit with plain Greek yogurt; a slice of whole grain toast with a tablespoon of almond butter and a sliced banana on top; or overnight oats--I love these three recipes from Nutrition Stripped here. 5. Plan ahead and prep in batches. 6. And don't overlook the power of the freezer. When it comes to saving time, frozen foods are your best friend. When I say frozen foods, I don't mean TV dinners, which are loaded with sodium and other additives. I mean whole foods that were frozen at their peak of freshness. Examples of things you can buy frozen are: organic quinoa or brown rice from Trader Joe's, vegetables (like broccoli or peppers), and fruit (like blueberries, raspberries, and mango.) When I'm in a rush, I'll heat up some frozen quinoa, stir in a half cup of low-sodium canned black beans and top with a few slices of tomato and avocado. You can also freeze some of your batch-cooked foods. 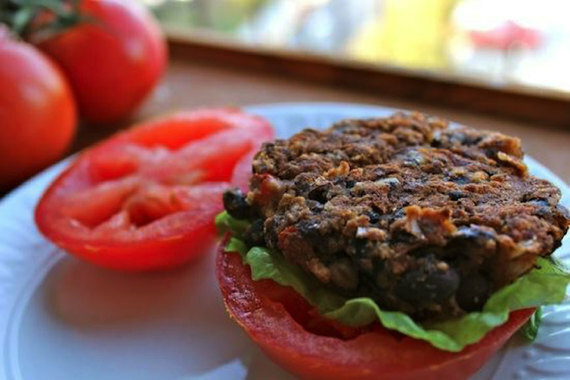 For example, if you make a pot of black beans (or a batch of black bean burgers), freeze the leftovers for the weeks to come. 7. Enjoy some one-pot wonders. If your reservation about healthy cooking is that you don't have time to get more than one dish dirty, you might want to consider the one-pot wonders. These are dishes where the only step is throwing everything thing in a pot and watching it go. 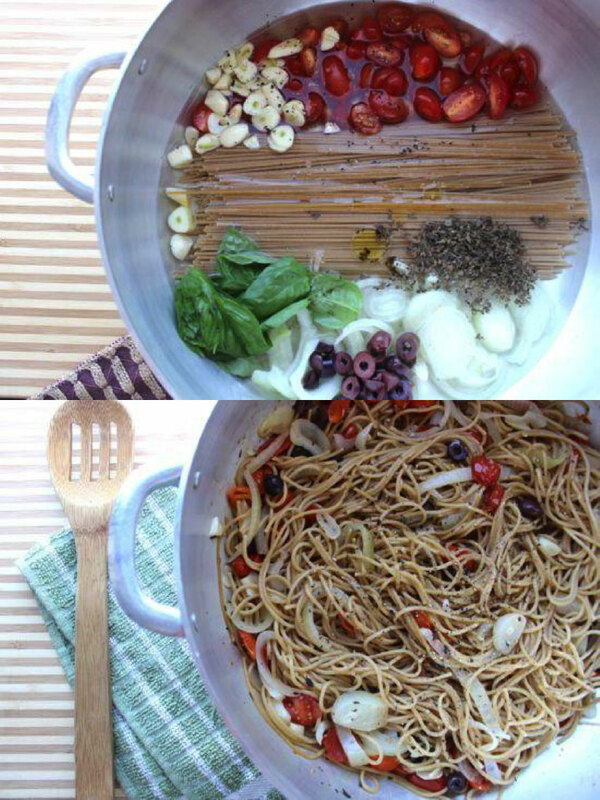 One of my all-time favorite one-pot wonders is our one-pot pasta recipe. Check out the before and after pics above and watch our video tutorial for more tips. Also, the crockpot is another great way to cook a one-pot dish while you are at work. I loved this podcast from The Nutrition Diva on why a crockpot is often overlooked as a healthy cooking method that saves time. 8. And show sofrito some love. One of the many wonderful things I discovered during my time living in New York was sofrito, which is a seasoning used for soups, stews, beans, and other dishes. You can buy canned sofrito from the grocery store, but it's usually loaded with too much salt and other not-so-great things. Make a batch of sofrito and store it in an ice cube tray, that way you can keep it fresh and add the perfect amount of flavor to your next meal. Whenever I'm making beans, rice, or pasta, I pop in an ice cube of frozen sofrito to turn up the flavor 10 notches. Check out my sofrito recipe here. 9. Just keep things simple. Spending hours preparing a complicated recipe every night is for the birds. (Not that there's anything wrong with that.) My motto is: only sign up to cook recipes that are basic with minimal ingredients. I find that when I try to get too fancy, I end up getting frustrated, defeated, and going to Chipotle to cheer me up. If you want to keep it simple, only commit to one or two new recipes per week that have five to 10 ingredients you can pronounce (and find at your local supermarket). Here are a bunch of my simple recipes that you can add to your repertoire. 10. Try creating a dinner calendar. This is not something I personally do, but I know people who swear by this, namely my mom. She finds that if she has seven simple recipes in rotation for each night of the week, it's much easier to stick to the plan and eat healthy. For example, she will do pasta on Mondays, tacos on Tuesdays, beans and rice on Wednesdays, salad on Thursdays, fish on Fridays, and so on. It also takes 99 percent of the wonder out of cooking, which is good for people who ain't got time for that. 11. Finally, don't forget about the work fridge.